Being the most successful tennis player in your country’s history does not necessarily mean all the fame and glory is given to you. Just ask Luxembourg’s Gilles Muller, whose array of ups and downs throughout his time on the ATP Tour has left him playing some of his best tennis towards the latter half of his career. "Mulles,” as he is often called, turned pro in 2001 after reaching the junior final at the 2001 Wimbledon Championships and winning the boy’s singles title at the U.S. Open later that year. Muller finished his junior career as the world No. 1, a 72–26 record and much promise on his shoulders. What would follow for Muller would be years of sporadic results on the ATP Tour, but fair success on the Challenger and Futures circuits. In 2002, Muller made his ATP debut as a wild card in ‘s-Hertogenbosch. After failing to make it past the first round of his first few events as a professional, Muller relied on his three Futures titles that year to get his ranking up. Having to qualify for main draw entry into events for the next few years, Muller found great success playing Davis Cup. Starting play as a junior in 2000, Muller has the most total wins (54) and most singles wins (34) out of any player to ever play for Luxembourg. In 2004, still finding mediocre success on the Challenger tour, Muller became the first player from Luxembourg to finish in the Top 100. Muller’s best performance that year came at the Legg Mason Tennis Classic in Washington (now the Citi Open). Entering the tournament with a 1-3 record in ATP events on year, Muller was able to pull upset wins over 2000 Wimbledon quarterfinalist Jan Michael-Gambill and Andre Agassi (his first Top 10 win) before losing to former No. 1 Lleyton Hewitt in final, 6-3 6-4. The next year would once again present patchy results for the Schifflange native but not without a few memorable showings. Still relatively unheard of to the world, Muller would upset recently crowned French Open champion and No. 4 seed Rafael Nadal in the second round of Wimbledon in 2005, 6-4, 4-6, 6-3, 6-4; this was also his Wimbledon debut. Muller shined again in the first round of the 2005 US Open defeating heavily favored No. 4-seed Andy Roddick in three consecutive tiebreakers, 7-6 (4), 7-6 (8), 7-6 (1). His greatest Grand Slam result came in 2008. After another subpar season in 2007, Muller came in to the US Open ranked No. 130. Having to go through three rounds of qualifying, Muller ran all the way to the quarterfinals, taking out former No. 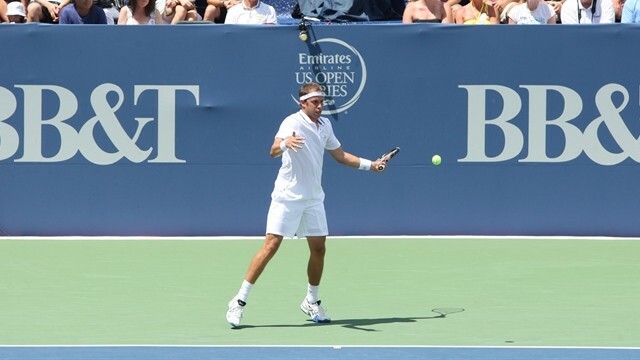 2 Tommy Haas, Nicolas Almagro and fifth-seeded Nikolay Davydenko before being stopped by defending champion and eventual winner Roger Federer, 6–7, 4–6, 6–7. The 32-year-old has been able to reach a career high of No. 34 as recently as February of this year, but after three finalist appearances and none since his 6-1. 6-7(2), 2-6 defeat to Roddick in the 2012 BB&T Atlanta Open championship match, Muller looks to start another run this July.